Have you wondered if there are fun or interesting ways to use coca cola instead of drinking it? You may already be aware of the coca cola and Mentos trick, but there are other more practical uses. All you will need to do is review some of the uses for coca cola around the home. Spray some coca cola where bugs are present to eliminate them. 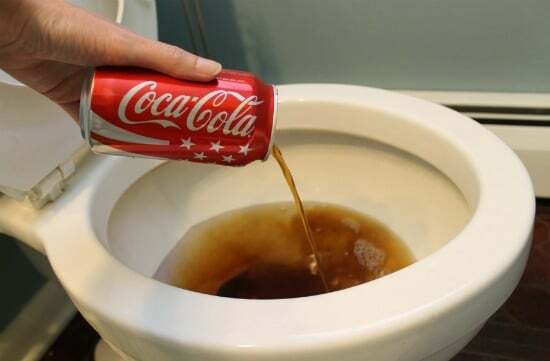 Simply pour a partial can of cola cola in your toilet and let it sit for an hour before scrubbing. Coca cola contains citric acid and means you can use it like any other citrus window cleaner. Stained coffee pots can be hard to clean unless you add some coca cola first. This is one of many practical uses for coca cola in your kitchen. Tools that start to show rust can be easily cleaned when soaked in some coca cola. Coins that are dull looking due to dirt and grime can look like new when soaked in coca cola. Pouring coca cola on corroded battery terminals is a simple way to get them clean. Pour some on your blackened pots and pans and watch the liquid loosen up the grime so you can easily scrub away the residue. Accidental spills of coca cola on a garage floor are not a problem and can even remove dirt and grime. Mix some of the soda with detergent when washing clothes to easily remove blood stains.